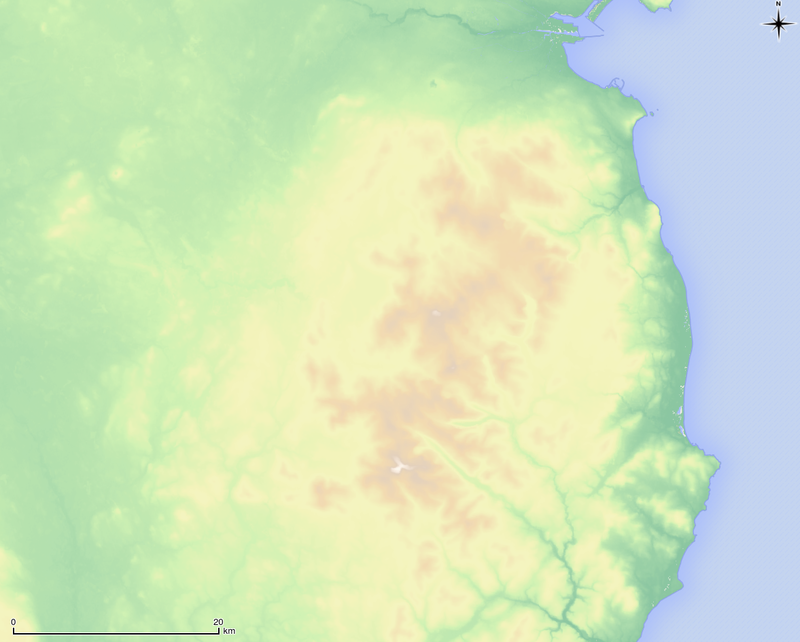 In this tutorial I will show you how to create a Hillshaded topographic map in QGIS. We will be using Shuttle Radar Topography Mission (SRTM) data, a near global Digital Elevation Model (DEM) collected in February 2000 aboard NASA’s Space Shuttle Endeavour (mission STS-99). 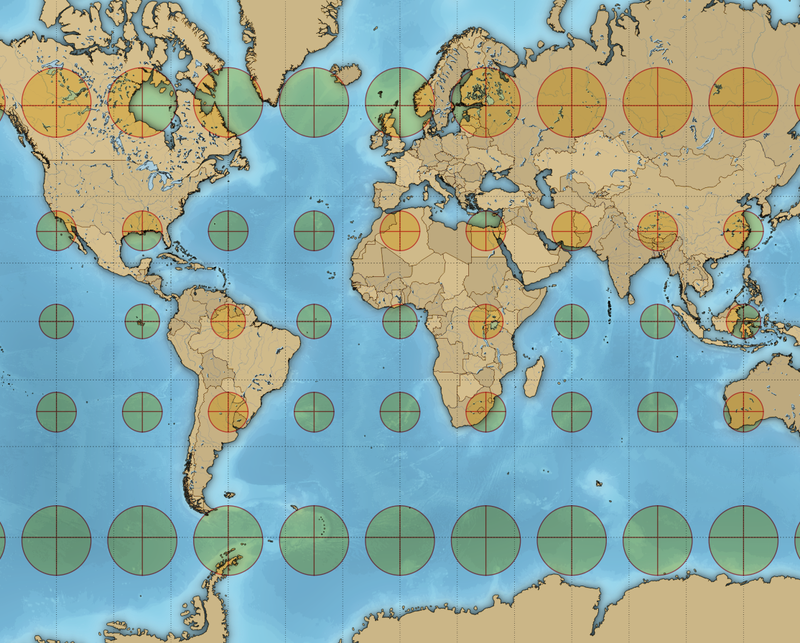 The mission used a X-Band mapping radar to measure the Earth’s topography, built in collaboration with the U.S. Jet Propulsion Laboratory, the U.S. National Imagery and Mapping Agency (now the National Geospatial-Intelligence Agency), and the German and Italian space agencies. The raw radar data has been continuously processed and improved since it was first collected. Countless artefacts have been painstakingly removed and areas of missing data have been filled using alternate data sources. The version we will be using is the 1 Arc-Second Global SRTM dataset, an enhanced 30 meter resolution DEM that was released last year. 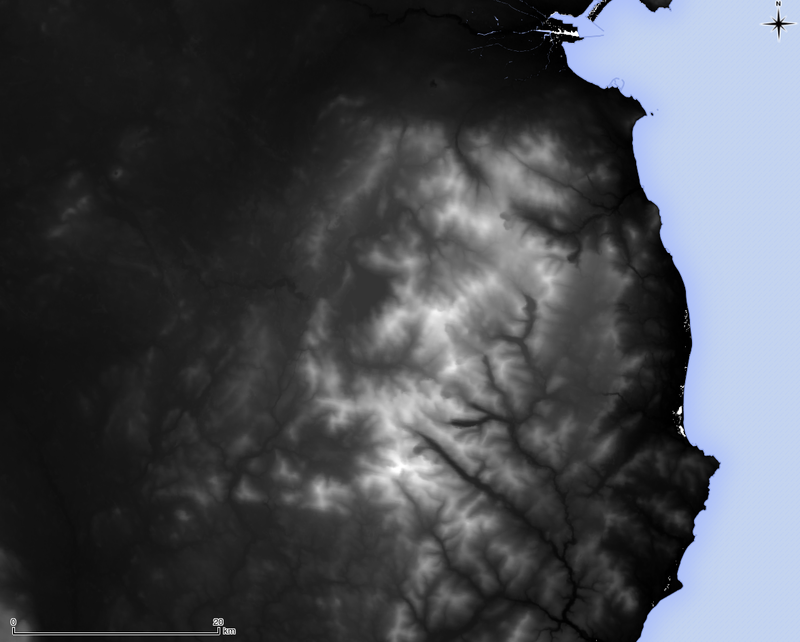 It is a substantial improvement over the 3 Arc-Second / 90 meter SRTM data previously available for Ireland. SRTM elevation data can be downloaded from the United States Geological Survey’s EarthExplorer website. 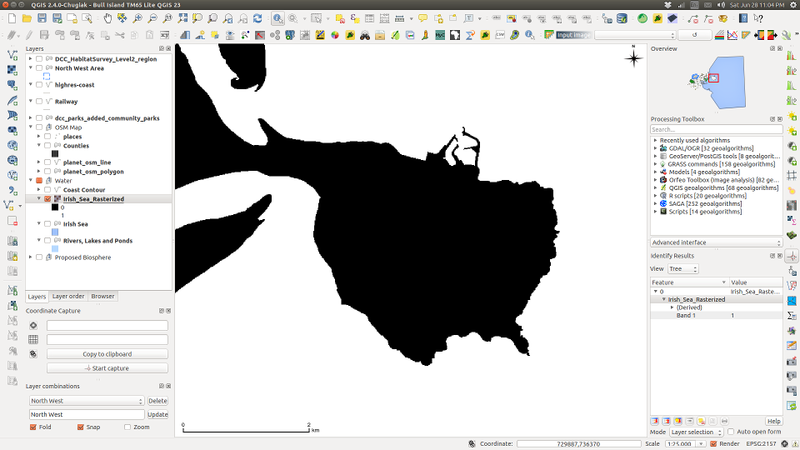 When first loaded into QGIS (via Add Raster Layer), the DEM is displayed as a rather uninformative black and white image. It is therefore necessary to apply a suitable colour ramp that accentuates topography. 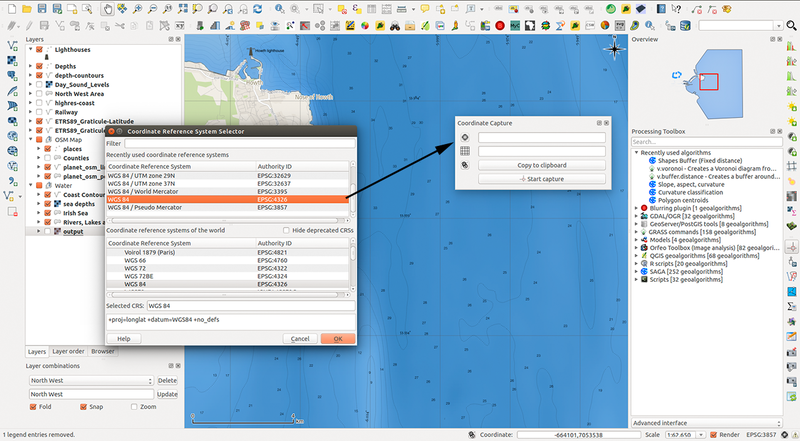 While it is possible to create your own colour ramp, or use one of the colour ramps provided by QGIS, superior colour ramps can be downloaded using Etienne Tourigny’s Color Ramp Manager (Plugins – Manage and Install Plugins). After the plugin is added to QGIS, go to the Plugins menu again and choose the Colour Ramp Manager. In the window that pops up, choose the full opt-city package and click check for update. The plugin will then download the cpt-city library, a collection of over a hundred cartographic gradients (version 2.15). After the package downloads, quit the dialogue. Back in QGIS, right click the DEM layer to bring up the Layer Properties dialogue. In the Style tab, change the render type from single band grey to single band pseudocolor. Then click new color ramp and new color ramp again, choose the cpt-city color ramp to bring up the cpt-city dialogue. Click topography and choose the sd-a colour ramp. While this is an excellent colour ramp, I find its colours are a bit too strong for my liking. Still in the Layer Properties dialogue, change the min and max values to match your DEM’s lowest and highest elevations values and click classify, this applies the new colour ramp. Next, change the brightness to 30 and lower the contrast and saturation to -20. Click OK to apply the new style and quit the Layer Properties dialogue. 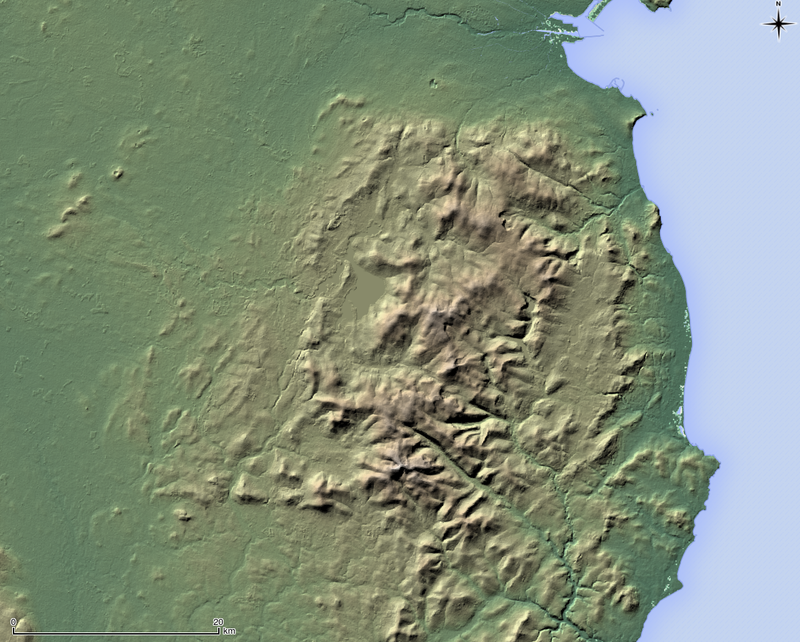 Next we need to create a Hillshade layer from the DEM, a 3D like visual representation of topographic relief. 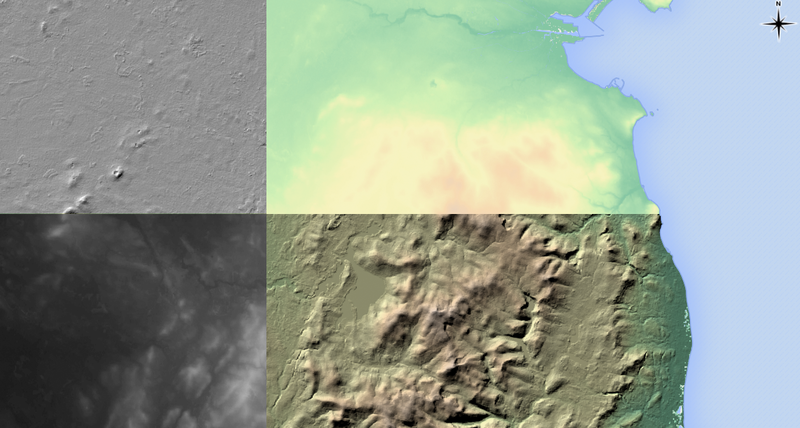 This is achieved via the menu Raster – Analysis – DEM (Terrain models). There is one small catch, the hillshading algorithm assumes the DEM’s horizontal units are in meters (they are decimal degrees). We need to enter a scale correction factor of 111120 (in the Scale ratio vert. units to horiz. box). Once that is all done, select an output path to save the generated hillshade and click OK. Generating a hillshade may take up to a minute depending on the size of your DEM. After the hillshade is created, open its Layer properties dialogue. Change the min and max values to 125 and 255, increase its brightness to 45 and contrast to 20. Finally, switch the blending mode from normal to multiply. This allows the DEM beneath the hillshade to show though. Click OK to apply the new style. If you followed these steps correctly you will have created a fine looking topographic map similar to the one below. It’s also possible to create contours but that’s a tutorial for another day. There are two hillshading algorithms available in QGIS, one by Horne (1981) and another by Zevenbergen and Thorne (1987). Jones (1998) examined the quality of hillshading algorithms, he found the algorithm of Fleming and Hoer (1979) is slightly superior to Horne’s (1981) algorithm. Zevenbergen and Thorne’s (1987) algorithm is a derivation of Fleming and Hoer’s (1979) formula. QGIS uses Horne’s (1981) algorithm by default. Horn, B.K., 1981. Hill shading and the reflectance map. Proceedings of the IEEE, 69, 14–47. Jones, K.H., 1998. A comparison of algorithms used to compute hill slope as a property of the DEM [PDF]. Computers & Geosciences, 24, 315–323. Zevenbergen, L.W. & Thorne, C.R., 1987. Quantitative analysis of land surface topography. Earth surface processes and landforms, 12, 47–56. ESRI’s ArcGIS Online World Imagery is a high resolution satellite and aerial imagery base map for use in Google Earth, ArcMap and ArcGIS Explorer. The same excellent imagery is used by the Bing Maps Aerial layer. Somewhat surprisingly, World Imagery can also be accessed by QGIS, as it supports ESRI’s map servers that use Representational State Transfer (REST) and Simple Object Assess Protocol (SOAP) standards. The code adds an ESRI Online World Imagery base map to QGIS. It has a number of advantages over the popular OpenLayers Plugin that adds various Google, Bing and OpenStreetMap image layers to QGIS. Unlike images downloaded by the OpenLayers plugin the ESRI World Imagery base map is a true Raster who’s attributes are fully editable e.g. brightness, blending mode and transparency can be adjusted. World Imagery can also be printed at a very high resolution with other QGIS layers on a map and without it shifting relative to other layers; a conspicuous problem with OpenLayers that does not use “On the Fly” re-projection and only prints Google, Bing layers at a low resolution. It is an ideal aerial base map. Before the advent of shipborne satellite navigation systems, navigation at sea required three precise measurements – Solar or Stellar Declination for Latitude, Time at Greenwich for Longitude and True North that determined the ship’s heading. True North was obtained from the ship’s Magnetic Compass, an instrument who’s name indicates at an additional complication. A magnetic compass does not point towards True North. Magnetic North is 100s km from the Geographic North Pole and the Earth’s magnetic field is uneven, it is distorted by magnetic irregularities within the Outer Core and intrinsically magnetic Mantle and Crustal rock. Additionally, the position of Magnetic North is not fixed, it is presently drifting from Arctic Canada towards Russia at 15 km per year. 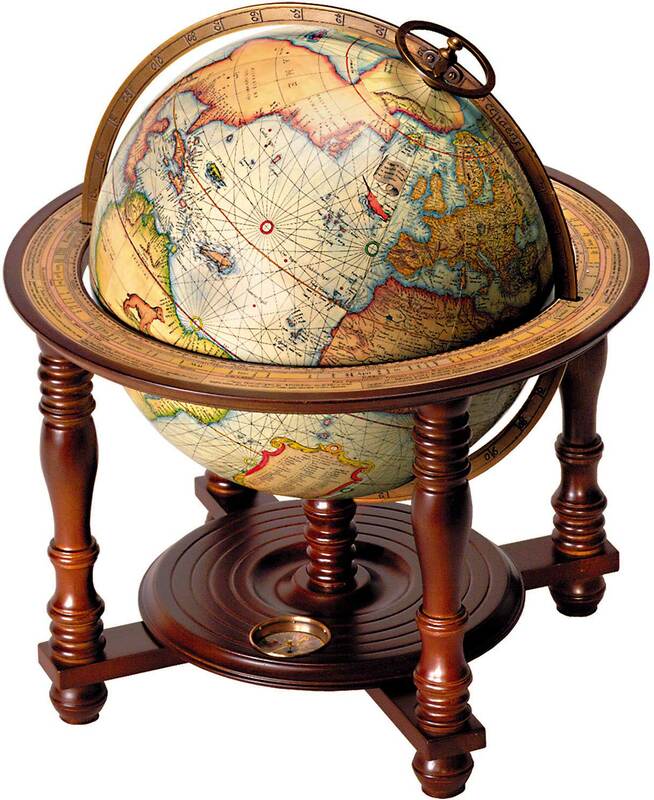 Therefore True North has to be derived from Magnetic North using a correction called Magnetic Declination (or Magnetic Variation), the angular difference between Magnetic North and True North. 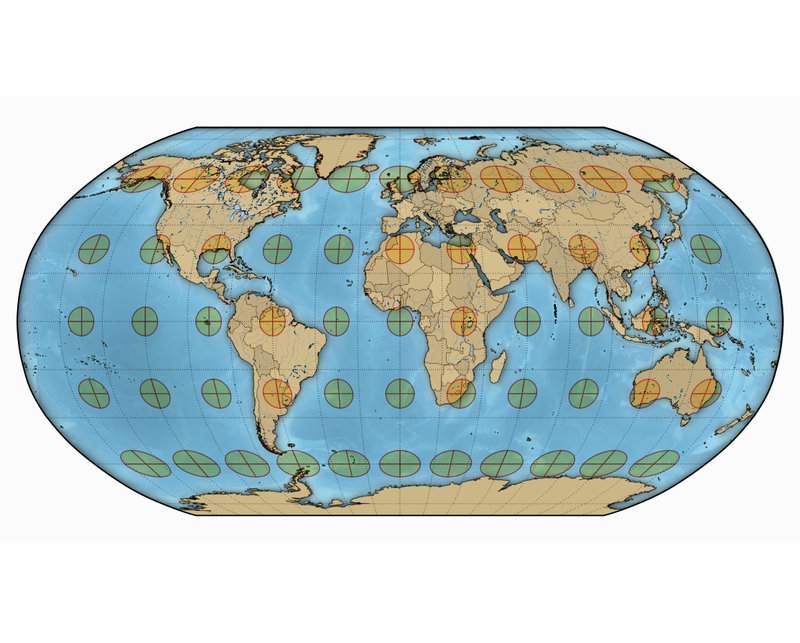 Magnetic Declination varies from location to location and over time. Nautical navigation charts typically contain one or more Compass Roses, also called a Windrose, these consist of two circles – an outer circle that displays the cardinal directions of North, East, South and West and a inner circle that displays the direction of Magnetic North. The Magnetic Declination and its annual rate of change is typically printed within the Compass Rose, it is therefore possible to calculate the Magnetic Declination several years after a map is printed. In this tutorial I will show you a process that to create a Compass Rose with the correct Magnetic Declination and Annual Rate of Change for any terrestrial location for use in QGIS. First we need to obtain a suitable Compass Rose graphic. Conveniently the United States National Oceanic and Atmospheric Administration (NOAA) published a Compass Rose in the Public Domain i.e. it is free to use without limitation. I downloaded a version of the NOAA Compass Rose from Wikimedia (or you can right click and save the Compass Rose below). Additionally, the background of this Compass Rose is transparent, this allows a map (or indeed a web page) to show though (note the Magnetic Declination in 1985 was 4 degrees 15 minutes west of True North and it had an annual decrease of 8 minutes of a degree per year). There are several handy on-line utilities that can calculate Magnetic Declination and the Annual Rate of Change but we shall use Charles F. F. Karney’s excellent cross-platform GeographicLib in this case. 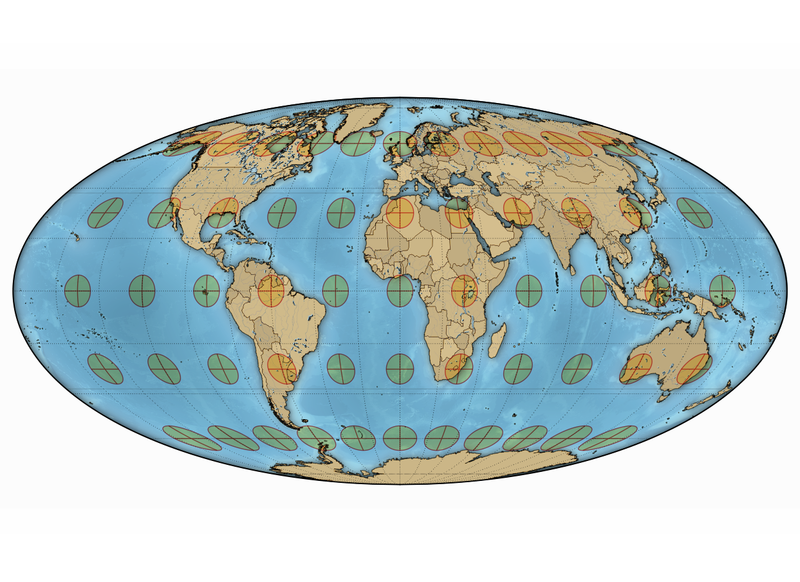 GeographicLib is a suite of command line utilities for solving solving various geodesic problems such as conversions between geographic, UTM, UPS, MGRS, geocentric and local cartesian coordinates, gravity calculations, determining geoid height, and magnetic field calculations. The latest version can be obtained as a pre-compiled binary from Sourceforge or as source code. The other essential step is to measure the precise map location in WGS84 coordinates. This can be done using the Coordinated Capture plug-in provided as standard with QGIS. To select the WGS84 coordinate reference system (CRS) click the sphere symbol in Coordinated Capture panel to open the Coordinate Reference System Selector. After setting the CRS to WGS84 (EPSG: 4326), click the icon left of the “Copy to Clipboard” button (this toggles real time display of captured coordinates) and then click “Start Capture”. The position in Decimal Degrees will be updated in the upper window as you move the cursor across the map, the lower window will display projected coordinates (in my case Pseudo Mercator EPSG: 3857). Clicking the map will select a coordinate point and the real time display will cease updating. The MagneticField utility of GeographicLib is then used to calculate the Magnetic Declination and Annual Rate of Change for the captured coordinate, in this case a location east of Howth, Ireland. $ MagneticField -r -t 2014-08-04 --input-string "53.37772 6.00935"
The results are: Magnetic Declination in degrees (-3.57); the inclination of the Magnetic Field in degrees (67.81); the horizontal strength of the magnetic field in nanotesla (18572.9 nT); the north component of the field (18536.9 nT); the east component of the field in (-1152.2 nT); the vertical component of the field in nT (45528.7 nT) and the total field (49171.3 nT). The numbers on the second line are the annual rate of change of these values, the first number is. We only need the first numbers on each line; the Magnetic Declination (-3.57) and Annual Rate of Change of Magnetic Declination (0.17). We can convert these to Degrees Minutes Seconds if required. 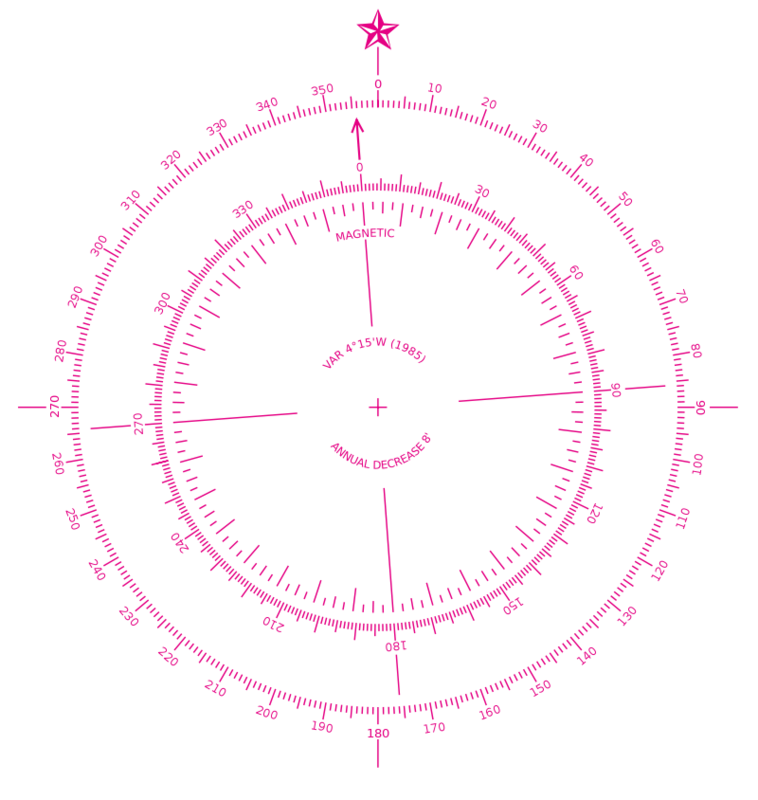 After calculating the Magnetic Declination and Annual Rate of Change, edit the NOAA Compass Rose in a graphics program such as GIMP or Photoshop. In my case I copied the inner circle to a separate layer and I rotated it 3.57 degrees anticlockwise. I then added text to the Compass Rose stating the Magnetic Declination (Var.) and the Annual Rate of Change (Annual Decrease). After editing the Compass Rose graphic I finally added it to my Nautical Chart as a Image in Map Composer of QGIS. 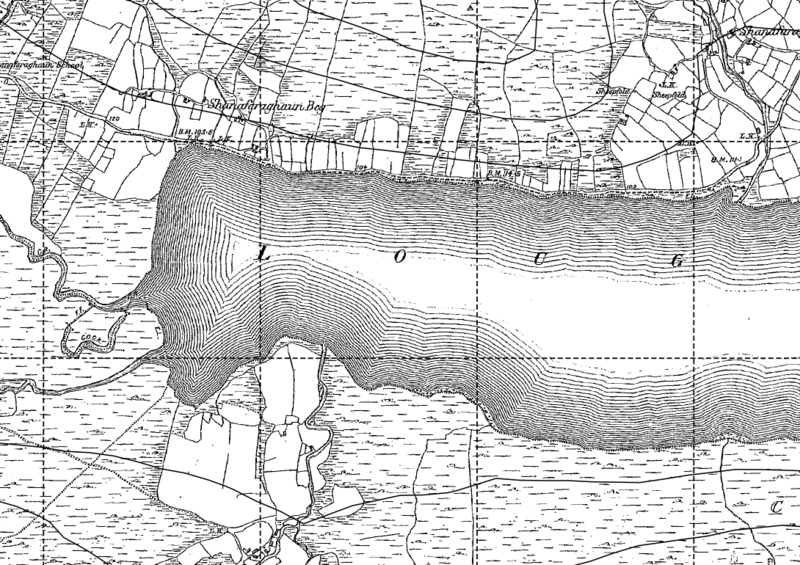 Occasionally on old maps you may see a pleasing decorative effect on bodies of water called a “Coastal Vignette”, these are fine lines that highlight coastlines and lake shores. The example seen above is from a ca. 100 year old “6-inch map” of Lough Nafooey in County Galway, Ireland. I presume the Coastal Vignette effect in this example was hand drawn, it required considerable skill and patience. 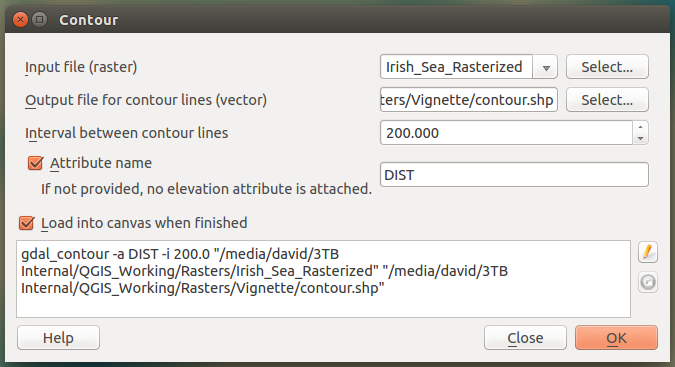 These is no plugin for creating Coastal Vignettes in QGIS just yet, so I developed a simple technique to recreate the effect using the raster ‘Proximity (Raster Distance)’ algorithm accessible in the Processing Toolbox. 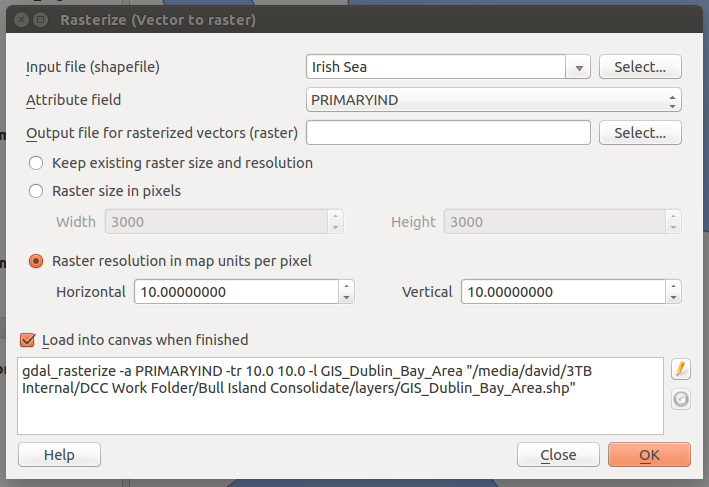 In order to use the Proximity Analysis tool I first converted a Shapefile polygon depicting the sea off Dublin into a 10 by 10 metre resolution Raster using the menu command ‘Raster – Conversion – Rasterize (Vector to raster)’. This generated a Raster that coded the Sea as ‘1’ (white) and ‘0’ (black) for Land. Next, I selected ‘Proximity (raster distance)’ from the Processing Toolbox – (GDAL/OGR) – [GDAL] Analysis – Proximity (raster distance). You can quickly find the command by typing the algorithm’s name in the box above the Processing Toolbox. I entered 0 in the ‘Values’ box, this tells the Proximity algorithm to measure the distance away from land (a value of 0). The resulting Raster contains cell values that correspond to the distance away from the coast in metres, which I styled below. 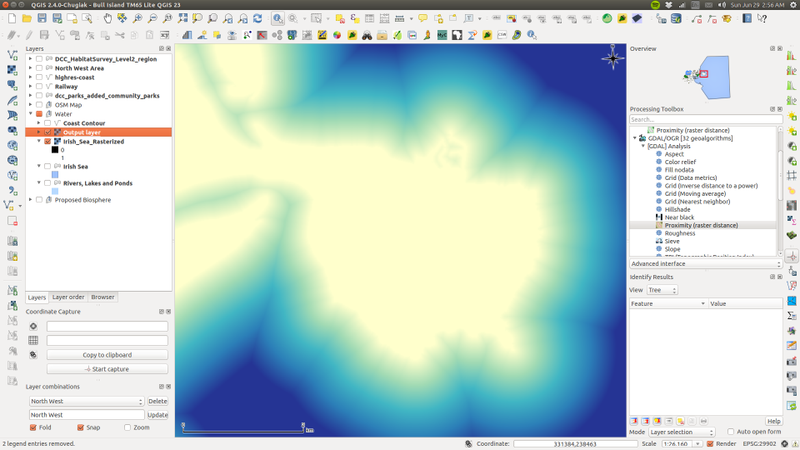 The final step is to create Contours Lines from the Proximity analysis result using the menu item Raster – Contour. In my case I used an “interval between the contour lines” of 200 metres and I added an Attribute name called “DIST”. The resulting contour lines have distance attributes attached to them can be used to create a Graduated colour style if needed, though in my cause I manually edited the attributes of 10 contour lines nearest the coast and I gradually increased the transparency of the mid-grey contour lines from opaque at the coast to fully transparent out at sea. I made the remaining contour lines transparent. 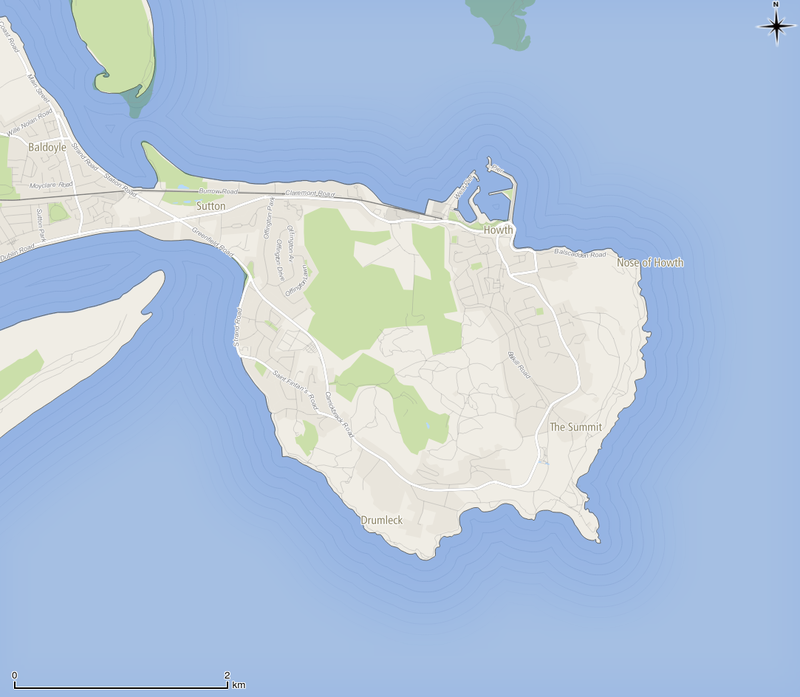 And here is the finished result, with the Sea and an OpenStreetMap base map styled to look just like Google Maps.